Shares of PNC Financial Services rose nearly 2 percent in premarket trading Friday. The regional bank beat estimates for both earnings and revenue. PNC also showed growth across several key metrics compared to the same quarter a year ago, such as commercial lending. 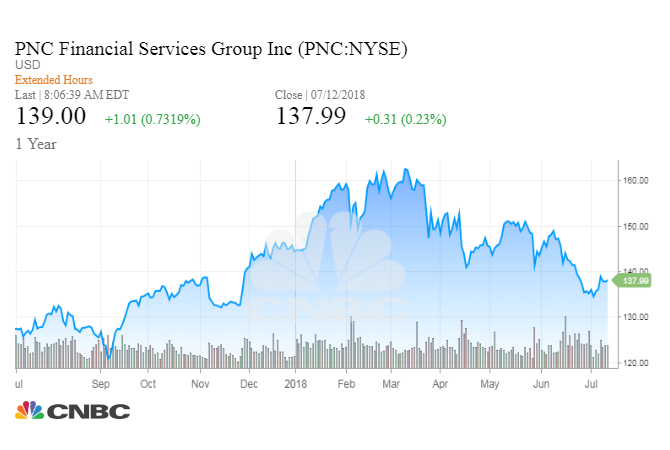 Shares of PNC Financial Services ended trading Friday up 0.2 percent after beating estimates in its second-quarter earnings report. The regional bank reported earnings of $2.72 per share, beating estimates from analysts surveyed by Thomson Reuters by 14 cents. PNC also posted better-than-expected revenue, bringing $4.32 billion, compared to $4.25 billion expected. PNC showed growth across several key metrics compared to the same quarter a year ago, reporting an increase in both commercial and consumer lending, up 3 percent and 1 percent, respectively, as well as net interest income, which rose 7 percent. PNC stock has risen over 11 percent in the past year, as of Friday's close at $138.32 per share.